While excitement levels for opening up your pool are reaching epic proportions, maintaining proper pool filters protocol is key for a successful season. Pools do require regular maintenance, but the upkeep is easy if you have the necessary tools and accessories properly prepared. Before your grand opening, thorough preparation will foster a successful pool season. You can save money by buying store-brand soda, but you shouldn’t look to skimp on proper pool filters. A quality cartridge type filter will have a pleated fiberglass mat or a synthetic filter media. Cheaper cartridge filters can break down if you try to excessively clean them, which will end up just costing you more money buying more filters. Cleaning filters isn’t as simple as spraying it with a hose, so make sure to invest the time to properly clean your pool filters. The first step in cleaning a filter is rinsing the debris off of the pool filter, but you should do this before the filter dries. If it dries, the debris will begin to set into the filter. Use a spray nozzle to wash off dirt and debris. After the debris has been washed away, the filters need to dry. Finding bright sunlight is your best bet for a completely dry pool filter. Once the filter is dry, you will want to remove any left over dirt or debris. There are several methods to do this, but find a solution that is right for you. Some people will tap the filter to knock out the debris, while others will use a paintbrush to remove any excess debris and dirt. Cleaning individual pool filters is not a productive way to spend your time, so it’s best to let a few that need cleaning accumulate. Once you have a few filters that need cleaning, place them in a large bucket with a combination of pool chlorinator and water. You will want six parts water to one part pool chlorinator. Leave the filters soaking in the bucket with the lid on for one-five days, with five days producing better cleaning results. When the appropriate amount of time has passed, pull out the filters, and rinse it in a bucket of clean water. You will want to thoroughly air dry the filters again, and make sure to brush off any more dirt or debris that appears trapped on the surface. In the original bucket that you washed the filters in, make sure it is sealed when not in use. You can save this mixture for your next cleaning. To dissolve minerals that form in the filter media, you will want another bucket, with 10 parts water to one part muriatic acid. As the filters soak in the acid and water, bubbles will start reacting with the mineral deposits. The minerals will be dissolved when the bubbling has stopped, and you can remove your filters. Make sure to seal this bucket as well, so you can reuse it for your next cleaning. Rinse the filters one more time, and allow them to dry. Once they are dry, you can reuse your filters! 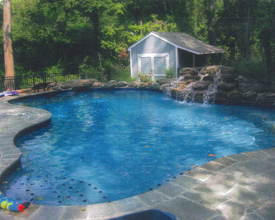 Sunrise Premiere Pool Builders has shared expertise with Maryland residents for over 60 years. If you need help with construction of your dream pool or spa, give our friendly staff a call today. Give us a call at 410-349-3852, or contact us online for a free quote! This entry was posted on Sunday, April 5th, 2015 at 11:25 pm. Both comments and pings are currently closed.